In Part One of this article I explored the value of established training programs. I summarized findings from across the industry attesting to the positive impact of training on the bottom line of an organization. As the project leader your bottom line is understanding the value of training and having strong evidence to back you up in order to preserve training budgets. This means developing a comprehensive training program that includes metrics and a support infrastructure that ensures the value of training is realized in the organization, and that the value is quantified in a tangible way. Simply sending a few people to a class does not change the way an organization operates. That's why creating a process that incorporates training is so key. Traditional measurement of training tends to focus on return on investment (ROI) metrics. It's important to keep in mind the differences between the narrow financial definition of ROI versus the commonly employed ROI analysis which goes beyond dollars and cents. The financial definition of ROI is simply the "ratio of money gained or lost (whether realized or unrealized) on an investment relative to the amount of money invested." (Wikipedia). When analyzing ROI in the context of learning, however, the benefits are many-fold and reach deeply throughout a project and organization. Simply comparing the cost of training to a dollar figure representing value gained is elusive and, by itself, probably not that meaningful. Therefore, a complete ROI analysis must be very inclusive. It's important to demonstrate that the investment in training has a clear relationship to tangible returns, such as performance improvement and increased market share, as well as delivering a concrete, bottom line dollar figure. 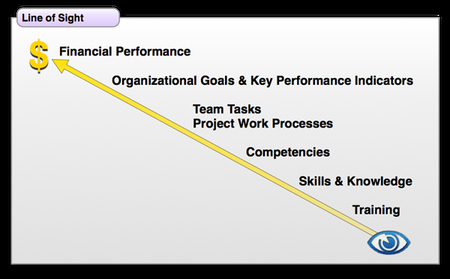 As Stephen J. Gill, Ph.D., an experienced training and performance consultant, points out: "In the employee training field, ROI has come to mean a comparison of all of the costs of employee learning to all of the impacts and benefits of the intervention, which can include employees retained, sales goals achieved, increased revenue, increased market share, job performance improvement, effective teamwork, customer satisfaction, employee engagement, etc." (Gill, 2009; see also ROI Institute). Impact on business (IOB), a method recently introduced by Blackboard, offers an alternative approach to ROI, focusing less on dollars and more on organizational improvement. Combining traditional ROI methods with impact on business (IOB) analysis presents a persuasive argument, and is an effective and valuable strategy in showing both dollars saved and the results of training. According to Timothy Hill, President of Blackboard Inc.s Professional Education group, the majority of training offices measure intangibles such as training efficiency or employee reaction to training, but only one in ten businesses actually measure the impact of training on the business (Hill, August 2009). Re-engineer learning and development strategies. Create tactics to deliver impactful learning. According to Blackboard, the IOB model gives you the tools you need to "measure the impact of corporate learning on your organization by how it impacts three areas: behavior you want to develop or replicate, business goals and bottom line financial results." You can learn more about IOB by requesting their whitepaper, "Looking for ROI? Youre Missing the IOB." (Blackboard Professional Education Group, 2009). The most effective way to communicate the value of training up the chain of command is to tie the costs of training directly and clearly to its benefits, making a clear connection to profitability whenever possible. This creates a direct "line of sight" from the training investment to the organization's bottom line. Rolled within this bottom-line figure there's ample room to express overall benefits, such as employee retention and improved efficiency. Training budgets become linked directly to business profitability. 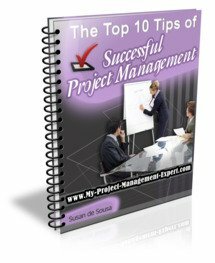 On a cursory level, if a training budget on a given project is, for example, 10% of the overall project cost, then presumably 10% of project outcome can be attributed to the training expenditure. You can also tie corrective cost directly to the investment needed to fix a problem. According to Jamie Allen of Exsell Training Solutions, Ameriquest identified that improperly completed time cards were resulting in an estimated ten million dollars in losses annually. After initiating training to educate employees, a program that cost six million dollars, the annual loss was reduced to $52 thousand in one year, a direct ROI of 160%. (Allen, 2010). Click here for Part 3 of Should Training be an Integral Part of a Project Budget to Increase Project Profitability?